In the weeks coming up to Valentine’s Day I have been perusing Pinterest for gift ideas. We even have a group board with some other wonderful bloggers – loads of great ideas in there to check out. I love the idea of making something special to share with my love on such a commercialised day. And these maps are the ticket. 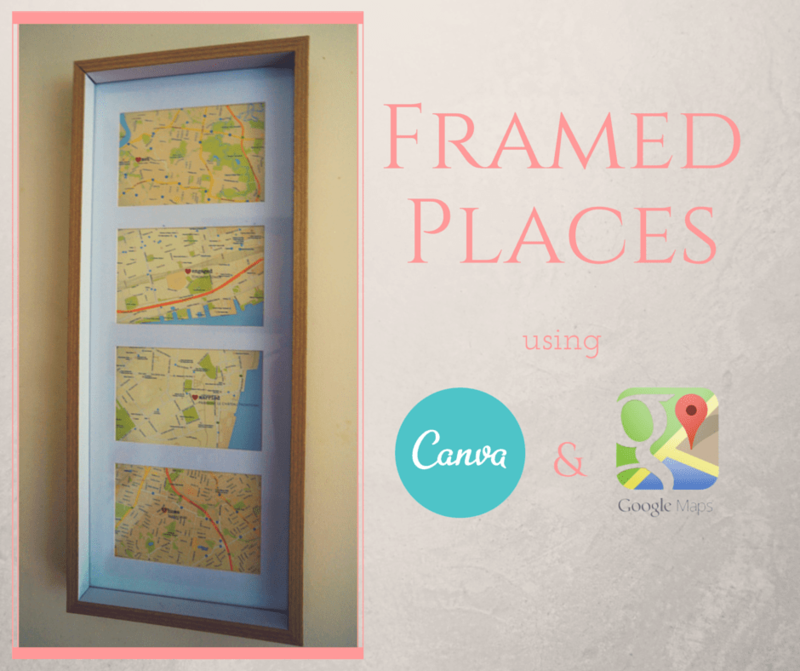 One of the ideas that I fell in love with last year was a series of framed maps, plotting out special places. You can read the tutorial on how to make this particular one here. In the spirit of internet creativity, I took this idea and adjusted it, using Google Maps & Canva, to make an anniversary present for my husband. But I think it would make a great Valentines day present. This is how I made my version. A frame that holds four photos. Target and Kmart both have inexpensive versions. Four places that are special to you and your partner. It might be where you met, where you got engaged or married, where your children were born, special holiday places, where you first lived, the places you have lived, the location of your first kiss, the list goes on! Take a screen shot (on Mac, this is Command + Shift + 4 to control exactly what is screen, on a PC use print scrn). Create a custom dimension image of 1200 x 1800 pixels (note the youtube video suggests100mm x 1500mm but using the pixel dimensions should give you a better resolution). Wow that is such a great idea and a special keepsake! Thanks Emily – I was quite happy with how it turned out. I have a new found respect for any blogger that does tutorials or recipes – and this was an easy one to put together. Thanks for popping by! I am glad you liked it. Oh thanks, I really hope you do! This is such a fabulous idea. After 21 years of marriage it can be so difficult coming up with meaningful presents to give to each other. I think this might cover our next anniversary. Tell me about it! I always scratch my head each year and we are only 9 years in 🙂 Last year I gave my partner 9 little handmade presents, and this was one of them. Wow, such a unique and wonderful idea! Love the step-by-step tutorials! Thanks for making Canva a part of your creative “must haves”. =) Awesome post and I’ve just bookmarked your blog. All the best! Love this! Think I might have to create one for our story. I did frame up a map of Italy with our favourite places we visited, but this suggestion is so much better! Thanks – it’s a pretty cute and easy one to do!